One fact about Homebrewers is that they love to make life more complicated than it needs to be. I know, I’m a homebrewer; and I’m as guilty as anyone on this account. For this reason I really try to separate the necessary from the unnecessary – especially when I’m teaching a beginner how to brew.As I lurk around a few of the homebrewing forums out on the Internets, one topic that often comes up is the issue of secondary fermentation. Experienced homebrewers often like to scare beginners with horror stories of all the nasty things that will happen to their beer if they don’t use a secondary. My opinion is that this step is unnecessary for most beginners, and is more likely to cause infections for inexperienced brewers. That said, they can be very useful under certain circumstances. A yeast starter is a way of taking a small yeast culture and making it larger and more active prior to “pitching” it into your wort on brewing day. 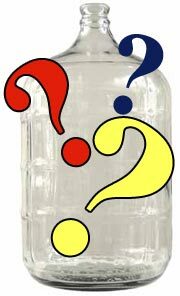 A lot of people ask whether you really need to do a yeast starter, and does it really help anyway? The short answer is that if you are only brewing 5 gallons at a time, and you are using White Labs pitchable yeast (or Wyeast Smack Packs, or something similar), then you probably don’t NEED to do a starter. If, on the other hand, you are brewing larger batches, or you are culturing yeast up from a slant, then you definitely need a starter. You will know for a fact that the yeast is viable and active because it is fermenting and you see bubbles in the airlock. Even store-bought yeast vials can go bad, and you really never know if the yeast is alive or dead until you see it fermenting. A starter will give you a larger inoculation. This decreases the likelihood of an infection, and increases your yeast’s ability to overcome the hardships of going into the beer. By starting the yeast in a wort that is similar to the beer you are going to make, the yeast will already be acclimated to the environment in which it will be fermenting. This improves the time frame that it takes to get a real fermentation started. Creating a yeast starter does increase the amount of time it takes to brew since you essentially need to have two brewing sessions instead of one. That said, creating a yeast starter is usually easier than doing a full brew because it doesn’t take nearly so long to start the boil, or to cool the wort prior to pitching the yeast. It is also easier to clean small equipment than larger, so you will find that the whole process of creating the starter is something you can easily do in the evening while you are watching TV. There are three methods to making a yeast starter. Each has its benefits. Take two cups of wort and a quart of water. Stir them in a saucepan, and bring it to a boil for 15 minutes. If you feel inclined, you can add a small amount of hops to this, but it isn’t necessary. Let it cool to room temperature, and then pour the simplified “wort” into a sanitized wine bottle. Put an airlock (sanitized also, of course) on top, and put it in a dark place to ferment. The best starters are actually just small versions of the larger beer. The reason is that this method gets the yeast acclimated to the environment it is going to be fermenting in. For most Ales this is probably overkill, but if you are making a high-gravity barelywine or some other “exotic” beer that might be on the edge of what the yeast would normally tolerate, then it’s a good idea to use this method to acclimate the yeast. So, you can easily make your starter by simply scaling your beer recipe down. Boil it just as you would for a full batch. Then, just as with the “Bare Minimum Method”, you cool it, put it into an appropriately sized (sanitized) container like a wine bottle, and put your (sanitized) airlock on it. Another option is to make 5 gallons of wort all at once – just as you would if you were making a full-size brew – and then break it up into individual “starter-size” packages. You can freeze them in 1 quart containers, and use them for future brews. The size of your starters depends on how large your batches are, but thinking in terms of at least a pint, but ideally a quart or more per 5 gallons is a good rule of thumb. My starters are usually two quarts per 5 gallons. The idea is to have your starter fermenting at full krausen by brew day. Usually, this means making the starter a day or two ahead. I do mine two days before. Keep in mind that the starter will not produce as many bubbles through the airlock as a full batch will – even when it’s at full krausen – simply because it is smaller. This is one of the great reasons to use a clear container for your starter. That way you can see the thick foamy head on the top of your fermenting beer and know it’s ready to pitch. Keep in mind that if you use a clear container, you should make sure to keep it out of the sunlight, but in an area that will be the same temperature as you plan to ferment. I put mine in my closet. When you are ready to pitch your starter into your final brew, place some plastic wrap over the mouth of your starter container, and stir or shake it up really well. Be prepared for the starter to foam up. You want to make sure the yeast sediment on the bottom is nicely suspended before you add it to your final beer. Finally, just pour the starter into your final wort. You will find that your fermentations will take off in a matter of hours, and you will be much more confident that your yeast are healthy and active on brew day. Good luck with your brews!